Three days after the former KNTV building was destroyed by fire, the Santa Clara County District Attorney charged a 55-year-old San Jose man on felony probation with arson and first degree burglary. Stillman Pfeffer was arraigned Wednesday afternoon followng the 5-alarm fire at 645 Park Avenue, which used to house KNTV studios from 1955 to 2004. Since then, homeless people have lived in the building. Pfeffer is homeless, though there is no indication he lived in the building. Prosecutors said witnesses saw him create the fire by dousing the building with a liquid accelerant, though no motive has been publicly established. Pfeffer did not enter a plea and is being held without bail, while dogs were sent to the building to search for possible human remains. He is on probabtion for petty theft and had three prior convictions, according to the Mercury News. Deputy District Attorney David Boyd said that there is no indication that Pfeffer was living in the abandoned building. He was on probation for petty theft, Boyd said. Pfeffer was arrested late Sunday night, Boyd said, adding that more than one person witnessed the fire being started, which led to Pfeffer being identified as a suspect. "There are eye-witness statements that show that this was not any accident," Boyd said. "There is evidence that a device designed to accelerate a fire was used in the form of some type of a ignitable liquid." As Pfeffer was in court, San Jose fire officials brought in cadaver dogs on Wednesday, indicating human remains may be buried under the debris on the site. "We are using two different search patterns - two different dogs ... two different times they came up with a hit in the same location," said San Jose Fire Capt. Cleo Doss. "We are going throught the excavation process right now to determine whether there is someone there." Firefighters will be bringing back cadaver dogs on Thursday. 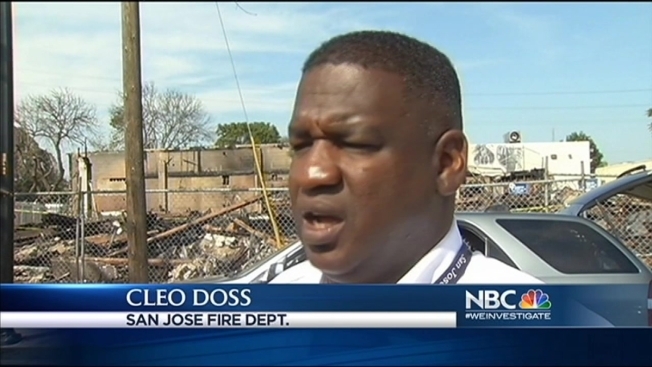 Investigators had told NBC Bay Area they suspect the fire was started by a person, because there were many homeless people inside at the time who had brought in their BBQ grills, propane tanks and motorcycles. 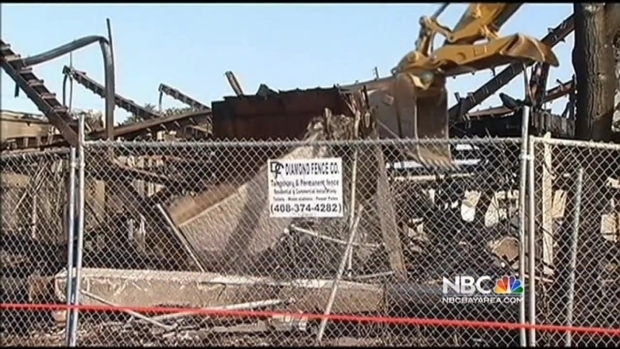 Bulldozers showed up Tuesday morning to raze down what remained of the burned-down structure that formerly housed KNTV's studios on Park Avenue in San Jose.